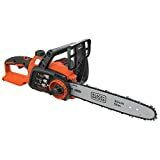 The Black & Decker LCS1240B 12″ 40V MAX Lithium Cordless Chainsaw is a bare tool item that operates with a 40v max lithium battery – (bare tool items do not include a battery). It has a 12″ Oregon low-kickback bar and chain which provides smooth and fast cuts. The tool-free chain tensioning allows for quick and easy chain adjustments and it also features a lightweight design for ease of use and maneuverability with less fatigue. The wrap around bale handle provides increased control and comfort. And, as an added features, this unit has an improved automatic oiling system which ensures constant bar and chain lubrication with a clear window to gauge oil level. Battery sold separately.